A Martin McNiff header goal deep into injury time won the points for the Bully Wee and deprived Annan of what would have been an excellent point in their quest to secure the last play off place. It was a cruel outcome for Annan who matched Clyde throughout the 90 minutes and it was the second time this season that Clyde won the game in injury time against Annan. Annan boss Peter Murphy was forced to make a change with Christain Nade missing out due to the head injury sustained in the victory over Edinburgh City in Annan’s last fixture and with Ross Ferguson picking up a groin strain in training it limited the managers options up front from the bench, there was a return to the starting line up for Tommy Muir and Tony Wallace. Danny Lennon also made changes bringing back Keiran Duffie and Mark Lamont into his starting eleven with Scott Banks and Jack Boyle dropping to the bench. There was no scoring in an evenly contested first half, Clyde snatched the lead through Mark Lamont in the 70th minute but Annan squared the game form the penalty spot after Blair Currie was sent off for a challenge on Tommy Muir then came the dramatic injury time winner which keeps Clyde still in with an outside chance of winning the title. Clyde started promisingly with David Goodwillie squandering a scoring opportunity in the 3rd minute when he failed to control the ball 6 yards from goal, minutes later the same player was thwarted by a good challenge from David Wilson. Annan soon got their game together but scoring opportunities were at a premium, the Annan goal survived unscathed in a goalmouth scramble in the 22nd minute with Goodwillie having three attempts all blocked yards from the goal. Tony Wallace then rifled in a shot from outside the area which forced Currie to tip over the bar. The best chance of the half fell to Chris Johnston who cut in from the left finishing but his low raking effort went narrowly past the post with Aidan Smith just failing to connect with the effort. It was a real let off for Clyde. 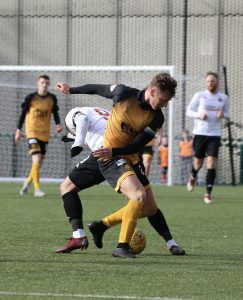 As the half came to an end the first yellow card was handed out to Peter Watson for a deliberate foul on David Goodwillie but the opportunity was lost when John Rankin’s 30 yard fee kick went narrowly past the post. Clyde brought on Scott Banks at the expense of Keiran Hughes in the 50th minute. Lewis Strapp sustained an injury in the 50th minute. Tony Wallace’s 65th minute effort went high and wide. Then came the opening goal in the 66th minute after Mark Lamont picked the ball up on the left to finish with a right footed shot from 16 yards which beat the outstretched arms of Alex Mitchell . A fine goal. Annan responded when Bradley tried his luck form the edge of the box but the effort went high and wide. Annan brought on Owen Moxon for Kyle Bradley in the 74th minute as Annan went all out to try and square the match. Clyde were being forced to defend then came the controversial penalty decision in the 86th minute when keeper Blair Currie brought down Tommy Muir and it appeared that the far sided Linesman who had the best view was instrumental in Annan being awarded a penalty kick. Blair Currie was red carded much to the disappointment of the home support it appeared harsh but after the keeper was changed Tony Wallace stuck the penalty away to square the match. Jack Boyle was introduced in the 90th minute for Mark Lamont seconds later Tony Wallace went close with a shot from the centre of the goal but the effort missed the target. The game appeared to be heading for a draw then came the winning goal after Clyde were awarded a throw in 12 yards form the bye line, McNiffs long throw in to the centre of the goal was not cleared and McNiff who had sprinted into the penalty area headed home from 6 yards to secure the points for the Bully Wee. It was a fine result for the home team, Annan for the second time this season have lost injury time goals against Clyde, there is very little between success and failure between the teams currently in the play off places and you cannot discount the possibility that both these teams could meet each other in the play offs.